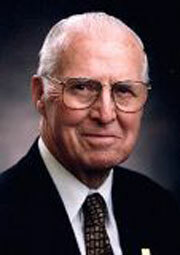 Cresco Iowa native and Nobeal Prisz winner Norman Borlaug died Friday. Norman Borlaug, the native Iowan who won the Nobel Prize for helping save millions of people in Pakistan and India from starvation died Saturday at his home in Texas at the age of 95. Borlaug’s work was dubbed the “Green Revolution” as it used plant breeding to create new varieties of wheat that were used to feed the starving people. Borlaug gave an address as the 2004 World food Prize Symposium where he talked about his early years in Iowa and how the influenced him later. Borlaug talked about his father building the family home in 1922 on the farm in Cresco, and showed a picture of the barn his father later built. Borlaug says the family moved onto the farm from his grandfather’s farm, and says his father bought the lumber for the barn from his savings just weeks before the banks collapsed in 1929. He says if the banks had collapsed before his father had bought the lumber, then they would not have had the barn and the farm might not have had the modest production that Borlaug says gave him and his two sisters their start. Borlaug says growing up in the midst of the depression led to his work to help the starving. “Life in those good old days was a sort of precarious thing, and I think it condition me for many of the things…that would happen later in life,”Borlaug said. Borlaug says another Iowan, former Ag Secretary and Vice President Henry Wallace, and the Rockefeller Foundation helped get the program started in Mexico that Borlaug used to feed the hungry. Borlaug says he used all the tools available to try and find a way to feed the hungry. He talked fervently in 2004 about how that approach has to continue. “Today this precautionary principle is fine for elite people in elite countries, but if you are dealing with hunger starvation, you better use the information you have at hand and use it courageously, and get the political leaders to see the benefit,” Borlaug said. Borlaug said at the time the resistance to genetically-modified crops was something that was holding back the efforts to feed the world. Borlaug says mother nature has for years used genetic modification as different crops developed. Borlaug says: “To me biotechnology, transgenics I prefer to call it, crosses, is a new tool that adds greatly. It needs to be combined with what we knew from conventional genetics and plant breeding. And it’s of great value and it can do things that we could never do before because of sterility barrier.” Borlaug wrapped up his presentation with a rousing call to action. “Remember that you can’t build peace on human empty stomachs and human misery. Thank you all very much, and go for it. Do something. Change it,” Borlaug said. Borlaug’s home and the one room school he attended are still in Cresco. Iowa’s two U.S. Senators introduced legislation this summer to have the home declared a national historic site.